Ancient Merv, in Turkmenistan, is one of the most complex and well-preserved urban centres on the Silk Roads of Central Asia. A succession of major cities at Merv started in the 6th century BC and continued until the Mongol sack of 1221AD, although Mongol occupation, a resurgent Timurid city of the 15th century, and expansion in the 19th century continues the urban sequence. Together the walled urban areas covered more than 1000 ha. 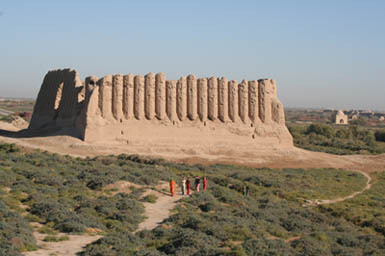 The Institute of Archaeology, University College London, has had a long collaboration with the Turkmenistan Ministry of Culture, focused on archaeological research and approaches to the conservation and management of the Ancient Merv Archaeological Park, which since 1999 has been a World Heritage Site. The collection of monument photographs (dating from 1890 onwards) was first compiled by Georgina Herrmann, former director of the International Merv Project, who published some of them in 'Monuments of Merv. Traditional Buildings of the Karakum'1. In 2002 an expanded version of the photographic collection was published in 'The Monuments of Merv - A scanned archive of photographs and plans'2, which included a CD-ROM with low resolution digital versions of the photographs. Since 2001 the Ancient Merv Project has added new images of the monuments, showing their current condition and conservation work, and more detailed metadata for the photographs has been assembled. More information on the Ancient Merv Project can be found at the UCL website. This digital archive was undertaken in conjunction with an electronic publication through the Linking Electronic Archives and Publications (LEAP) project. The corresponding article is 'The urban landscapes of Ancient Merv, Turkmenistan: Where to draw the line?' by Tim Williams & Sjoerd van der Linde, which can be found in Internet Archaeology 25.